A kitten was rescued at a recycling facility in Galt, Calif. on Dec.15, 2015 and adopted by an employee. A kitten was rescued at a recycling plant in California, proving cats may actually have nine lives. Employees at Cal-Waste Recovery Systems in Galt, Calif. were picking up debris from a conveyor belt on Tuesday, when one of them heard a noise beneath a black bag, the recycling facility’s spokeswoman MaryBeth Ospital told ABC News today. Tony Miranda, the last employee in the line overseeing the belt, immediately picked up the bag and found a grey and black kitten among the debris, Ospital said. If Miranda hadn’t noticed the tiny, female kitten, she would have continued up the conveyor belt, and the cat would have been dropped into "really fast moving blades that shuffle cardboard off and separate the rest of the materials," Ospital said. "It was seconds away from going up the conveyor belt,” she added. “I can’t imagine that cat would’ve survived that." 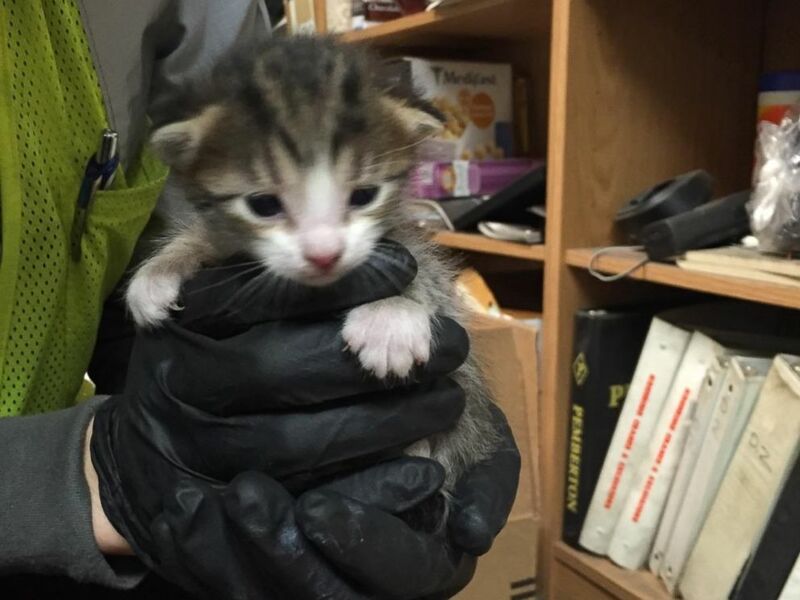 Employees were even surprised that the kitten survived getting to the facility, Ospital added, because in order to do so, she had to have been picked up by a garbage truck, dumped on the ground with the other materials outside of the plant and scooped up by a tractor to be put onto the conveyor belt. "If she went through all that, that is a cat that has nine lives," Ospital said. Ospital and other employees took care of the kitten for the rest of the day and fed her milk with a syringe, she said, until the kitten went home for the night with Ospital. The next day, Heather Garcia, an employee and mother of two, decided to adopt the kitten, Ospital said. "We named her Murphy because we found her in our MRF -- our Material Recovery Facility," Ospital said. Ospital is unsure of Murphy's age but said she is "very, very young," and is "truly a miracle." "It just made [Miranda's] day to rescue this little cat," she added. "I think it made a lot of peoples' days."